One of the biggest stories in the resource sector this year is how well Australian gold stocks have performed. They’ve absolutely crushed their peers in the western hemisphere. 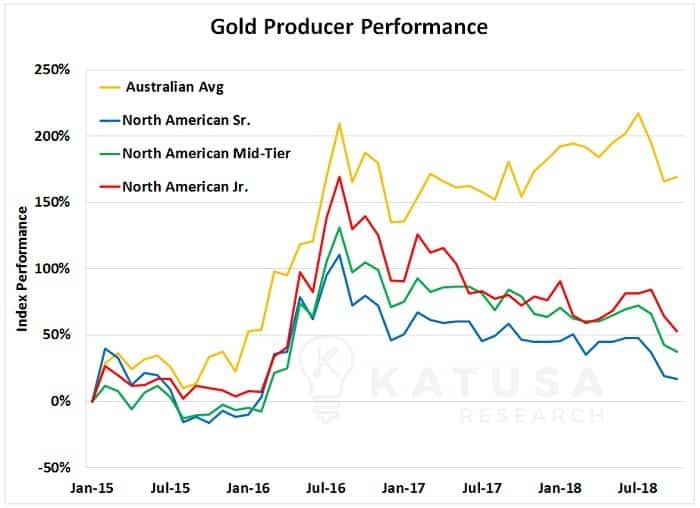 Below is a chart which shows the huge out performance of the Australian gold producers over their North American listed cohorts. You can see the gap in returns is very wide. While the gold market has been lousy in North America, in Australia things are much brighter. And this will lead to what I call the Commonwealth Takeover™. Why Have Australian Gold Stocks Outperformed Their North American Counterparts? Dilution destroys shareholder value. In the current resource market, a lot of companies are trading at a big discount to their Net Asset Value (or NAV for short). This is one of the most critical FTDs (Financially Transmitted Diseases). However, when a company is trading above its peers on a NAV basis, management will want to take advantage of their financial valuations. They do this by taking over the best assets that are trading at significant discounts to their NAV. The end result is a rise in shareholder value. Put simply, the company will use its shares as currency and go out and buy another company in hopes of boosting shareholder value. Right now, there is a small group of gold producers that have seen their share prices go on an absolute tear. And they’ve got more cash on their balance sheet now than they’ve had in the past 5 years. The market has rewarded this situation. Australian gold producers have seen an average return of over 150% since January 2015. 2018 is the first year ever that Australian mining financings have been greater than the Canadian mining financings on the TSX/TSXV. 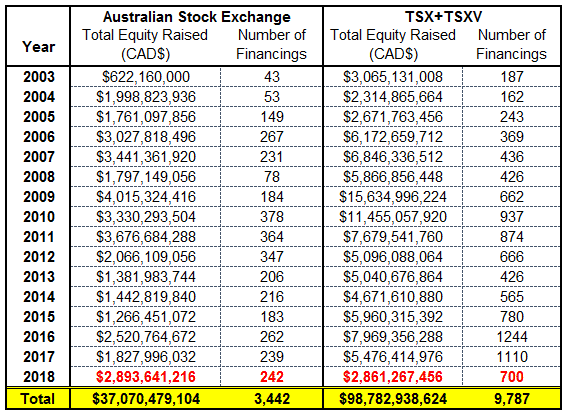 Below is a table which shows the annual financings in the mining sector for both the Australian Stock Exchange and the TSX/TSXV. Not only have the Australian mining companies raised more money than their Canadian listed peers, but they did so with 65% fewer financings. The Australians have fewer “keep the lights on” financings. These are financings for what I call zombie companies. The Australian companies have raised a higher percentage for domestic production and exploration than their Canadian peers (a testament to the pro mining government in Australia). Over the past 3 years, the Australian dollar has depreciated by 11% relative to the U.S. dollar. This created a windfall for Australian gold producers, who have seen domestic gold prices rise faster than domestic production costs. The result was a huge increase in free cash flow for the Aussies. 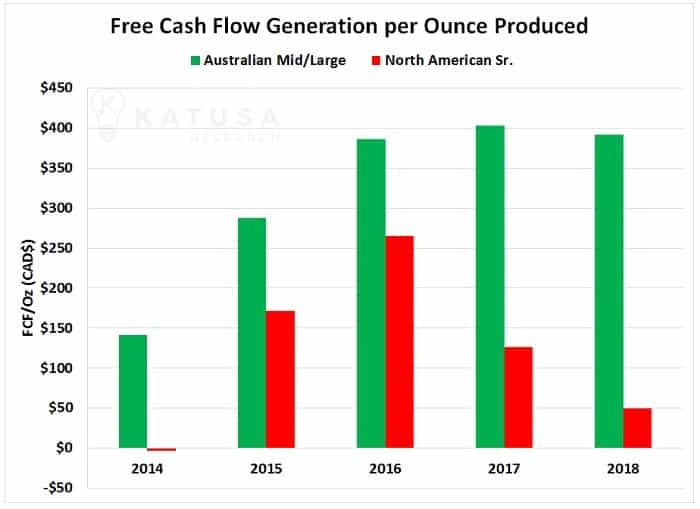 Take a look at the chart below which shows the average free cash flow generated per ounce of production for Australian producers compared to North American senior producers. Cash positions and valuations for Australian gold miners are the highest they’ve been in 5 years. Australia is part of the British Commonwealth. Most gold companies are listed and funded via the Canadian stock exchange (TSX and TSX-Venture). Thus I’m calling this the Commonwealth Takeover. Right now, the Australian producers are in a stronger financial position to buy out their weaker Canadian peers. 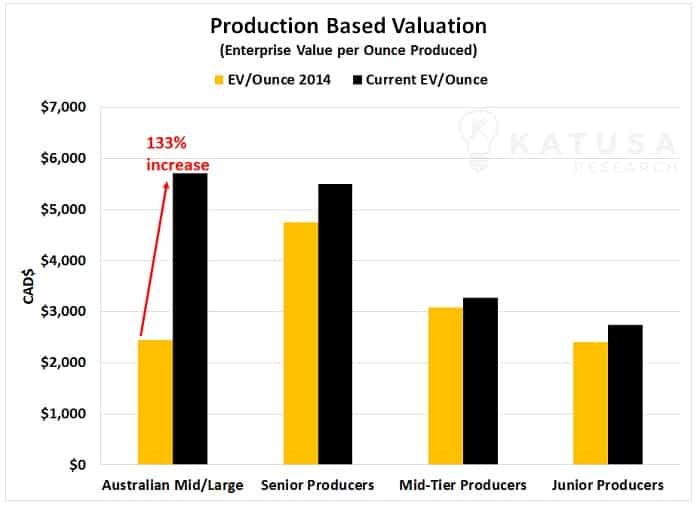 Below is a chart which compares the Australian mid/large gold producers against the North American listed senior, mid-tier and junior producer peer groups. You can see the Australian producers went from being much cheaper than their North American peers in 2014 to now more expensive. Now is the time to go shopping. It’s time for the Australian gold producers to use their elevated share prices and fat bank accounts to prey on the underperforming North American market. Below is a table which shows who I believe are the top 7 companies looking at buying or merging with North American listed producers. Take a company like Newcrest Mining (NCM:ASX) for example. This Aussie gold producer is going to produce around 2.4 million ounces in 2018. Newcrest has over CAD$1.2 billion in cash right now and generates over CAD$450 of free cash flow per ounce of production. That type of free cash flow makes North American gold executives blush. On a free cash flow per ounce produced basis, there isn’t a North American listed senior gold producer who can compete with that type of profit margin. But, I bet they’d all like to partner up with someone like that. Ian I know you’re reading this, what do you think? What Assets are Australian Gold Producers Looking For? When it comes to gold assets, there’s something for everyone. There’s short term arbitrage available to nimble Australian producers who want to pick up cheap North American producers. An open pit gold mine in Canada is going to have similar production costs and similar currency fluctuations. Many quality gold assets in North American companies are trading at discounts to what they’re worth in Australia. In 2015, NewMarket Gold (led by Doug Forster) was brilliant in scooping up Crocodile Gold which was an Australian gold producer. Katusa Research was the first to publish research on the transaction with a full analysis and I disclosed I was buying just under 10% of NewMarket. I published that report in May 2015 for all to see for free on my website. Shortly after, Kirkland Lake (KL:TSX) swept in and took over Newmarket Gold and netted Katusa Research’s first 1000% gain. Kirkland Lake then went on to be the best performing North American gold producer. The Australians are taking one out of the Canadians’ play book now. And that’s leveraging high valuations into partnerships with North America’s largest producers. I could see some of the big Australian names go this route, likely merging with Goldcorp (GG) or Newmont (NEM). It’s an opportunity to build a company with outstanding operations in all safe corners of the globe. All while monetizing a higher NAV. We’ve already started to see some rumblings of the Aussies coming across the pond. Northern Star Resources (NST:ASX) recently acquired the Pogo deposit in Alaska from Sumitomo (TYO: 5713) for CAD$338 million. Pogo averages 300,000 ounces of gold production per year at 13 grams per tonne and still has another 10+ years of mine life. This was a great deal for Northern Star. I’ve met the Northern Star management team, they’re tenacious and well on their way to building a world class gold mining company. I have a proprietary database of every producing asset owned by North American producers. I have my list of potential take out candidates. Newcrest (NCM:ASX) or Evolution Mining (EVN:ASX) are not going to waste time and money buying up 50,000-ounce producers. I’d argue there’s 2 or 3 mines in North America which are for sale. And a small handful of others that could be acquired if they got creative with a third-party. It’s important to remember that we are deep in the trenches and the North American resource markets are very tough right now. But quality assets are being eyed by those in predator mode. I’ve been writing to my paid subscribers of Katusa’s Resource Opportunities about the coming Commonwealth Takeover. I’ve published which companies and assets are most likely to be taken out and the reasons why. I do believe that 2019 will be a memorable year for the Aussies. Note: I do not have any positions in the companies mentioned above.